INSIDE THE WRITING IN GAMES | CD Projekt Red, Brianna Lei, Meg Jayanth, and more divulge how they approach writing the smaller parts of games. Over months of interviews, email exchanges, waking up far too early for Skype calls at opposite ends of the world, and sifting through a novella-sized document of transcriptions, one note stuck out to me. It's something that CD Projekt Red story director Marcin Blacha told me early on: "There needs to be a place for both stories about blue cheese and human tolerance." What Blacha means, of course, is that there needs to be room for all sorts of stories in video games. Silly ones. Serious ones. Political ones. Personal ones. Nonsensical ones. Decades ago, this may have seemed like an unattainable dream; a spreadsheet with too many tabs, if you will. In recent years, it's looking more reasonable. From following the real-life risks of Syrian migration to Bestiary entries that tell more than just hints on slaying a monster, games are pulling from all sorts of familiar inspirations, and pulling them into exciting directions in new ways. For video games based on film or literature, the process is more complicated than a traditional adaptation. There's its many moving parts, its multiple disciplines, its complications that can arise from technology, or just the perils of working collaboratively. This poses a whole new challenge for game developers tasked with retaining the spirit of an original work, since they have to iterate upon it too. 80 Days even birthed its own game engine, InkleWriter, which is unfortunately shutting down later this year. 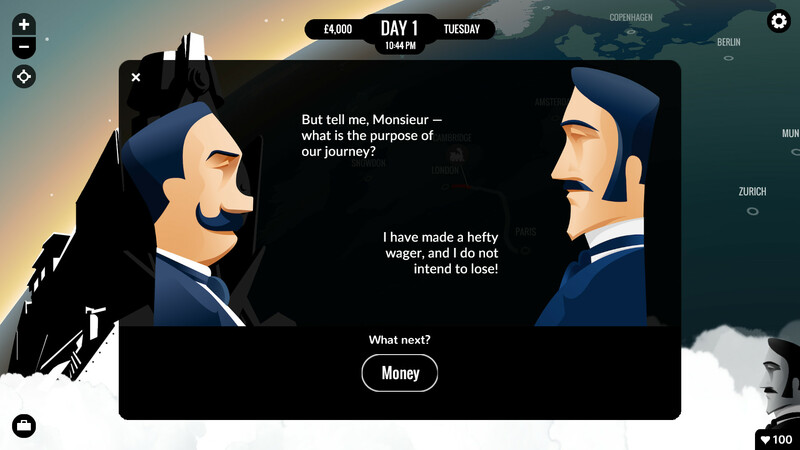 80 Days, the interactive fiction game from Inkle Studios, is a loose adaptation of Jules Verne's novel Around the World in Eighty Days. As writer Meg Jayanth tells me, it's an "an adaptation of spirit, rather than letter." Featuring writing from Jayanth and Jon Ingold, 80 Days is a journey with a spiderweb of possible directions the player can venture to. And, like most things, it's rooted in real history. Its scale was originally much smaller. At the start, only about 10 to 20 cities with a few connecting journeys were planned. The small team at Inkle quickly realized that 80 Days needed to be bigger if it was going to work. "I think it was Jon who first started talking about 80 Days as a kind of board game—that the player would want to move from any one place to a neighbouring place, as though the world was divided into hexes. That resulted in a massive increase in scope," writes Jayanth over email. "I think it would have been almost too daunting had we planned out the scale of 80 Days at the outset. As it was, it crept up on us, but at each stage the benefits were absolutely clear. We needed 80 Days to feel teeming to really work." In writing 80 Days, Jayanth found the most joy in historical research. Specifically in finding some obscure fact, and folding it into the story somehow. "My favorite moments are those that players assume must be completely fictional or invented, but actually turn out to be largely based on truth," she writes. "History is often much more strange and unexpected than even the most fantastical invention, and I found a real joy in sharing that." 80 Days is quite a bit different from the book it's based on too—it's in a steampunk setting, most notably—and despite that, ends up feeling just as exciting as readers of Verne's novel likely felt back in 1873. One of the best-known literary adaptations is CD Projekt Red's The Witcher series, which peaked with The Witcher 3: Wild Hunt—a game that's often regarded as one of the best of the current generation. Story director Marcin Blacha points to the character of Triss in particular, who is a former love interest in the later Andrzej Sapkowski novels but remains a possible lover in CD Projekt Red's adaptation throughout. The potential romancing of Triss is just one layer of Geralt's "elasticity," where players can nudge him in different directions within the frame the game and literature backing confines him in. Geralt always feels like the Geralt from the novels as a result. "I really like ghost stories myself and for this particular example, my inspirations were tales written by Edgar Allan Poe and Wuthering Heights by Emily Bronte," says Blacha, regarding the haunted manor portion of the Hearts of Stone expansion. Hearts of Stone, The Witcher 3's first major expansion, feels more literary than the base game, like an anthology of short stories woven together. Blacha explains that this format was intentional. Immediately after completing the base game, Blacha explains that the team looked back on their favorite moments on The Witcher 3, from the harrowing Bloody Baron questline to the more humorous scenes like the witchers drinking at Kaer Morhen. The writing team at CD Projekt Red wanted to mesh those two elements together somehow. 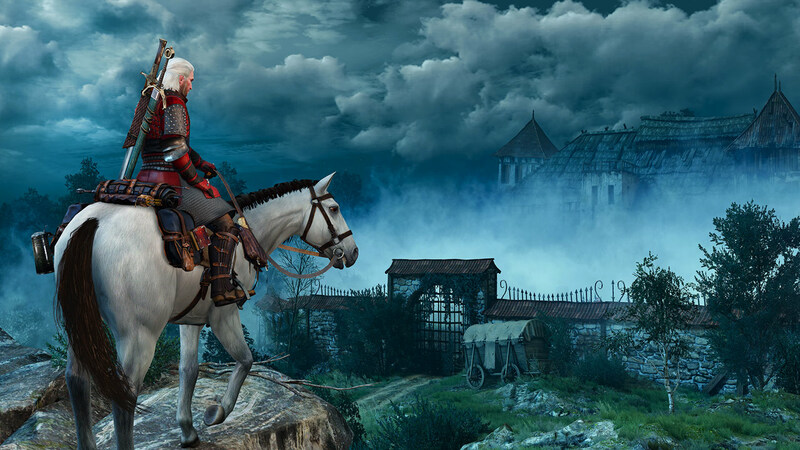 The result became Hearts of Stone: An expansion that balances all the peak emotions of The Witcher 3, such as a hilarious sequence of a pompous, womanizing ghost possessing Geralt to a creepy encounter with a monster that looks straight out of Silent Hill. "I proposed the anthology model, in which various stories are connected to each other through their theme and characters," Blacha says. "This simplicity allowed us to focus on individual elements of the anthology. Every story had a theme we wanted to point out but there were no other goals we set up for ourselves rather than simply having fun with it. Every quest present in Hearts of Stone is inspired by other media—whether movies or literature. We had ideas manifesting from heist movies, gothic novels, or Polish folklore." The Bestiary from The Witcher 3, in particular, is a unique avenue that's used to flesh out its world. The Bestiary isn't just a guide to how to defeat its many monsters and beasts: it's also a tour through the world's own folklore. "Our idea behind it was that monsters aren’t just roadblocks on the way to the goal. They are a part of the overall ecosystem and exist not only for the player to defeat—they are involved in people’s lives and the entire flora and fauna of the world we create. So when our team was working on the Bestiary, we looked at those creatures in the same way people actually living inside of our game world would," Blacha says. The Bestiary, in turn, enlightens people's greatest fears and their own personal viewpoints on the world; such as the griffin from the early White Orchard section of The Witcher 3, wherein the griffin's mad at the locals for killing its mate, and the townspeople are mad at the griffin for killing people. They're all driven by grief and love. Far away from CD Projekt Red and Jayanth's base in Europe, game developer Brianna Lei grew up in a dominantly Asian community in the San Francisco Bay Area. Naturally, Lei channeled these experiences into what would become a cult hit: the queer dating simulator Butterfly Soup. 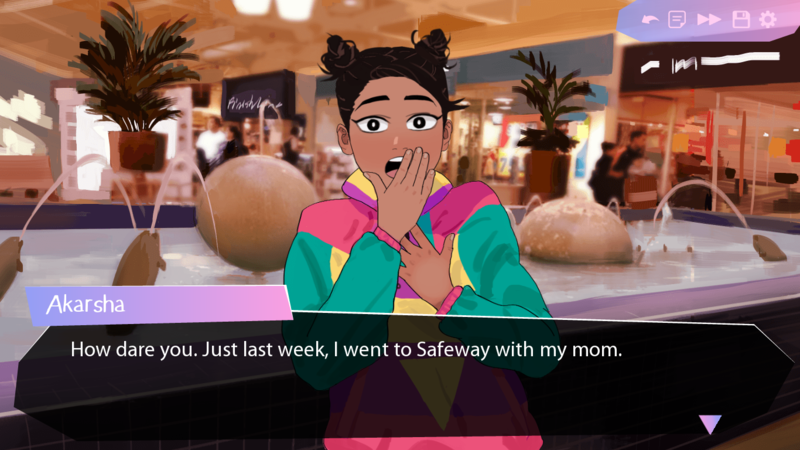 Butterfly Soup connected with players because for one, it’s sweet (a surprising rarity for dating simulators), and better yet, relatable. But what jump started the game stewed from an absence; a void that Lei wanted to fulfill for her past self and others like her. "Most sitcoms and teen dramas had no relevance to my life at all, and watching them made me annoyed. It was usually obvious the creators of those big budget shows or movies didn't value people like me at all," Lei says. "As a creator I like making niche games, so I naturally wanted to make at least one game filling that particular void that I felt growing up." In writing Butterfly Soup, Lei found herself inspired by sports anime and the U.K. teen drama Skins; the former because of its character interactions, and the latter for its character focused episodes, similar to what would become Butterfly Soup's structure. Butterfly Soup earned widespread praise last year for its humor, inclusive subject matter, and charming tone. Dating simulators have a reputation for having downright mean and nasty suitors for wooing. But for Lei, dating simulators were completely foreign to her as someone who hadn’t really played them before. Bulldozing the preconceived genre expectations of a dating simulator happened basically by accident. Even journalistic projects are being molded into video games. The interactive WhatsApp message-driven Bury Me, My Love from The Pixel Hunt is one of the latest. Developed by a small team with a background in journalism and other “newsgames” (journalistic games developed with the idea of "turning the world into something more understandable"), Bury Me, My Love follows a Syrian refugee's journey to Europe, and everything that goes right or wrong along the way. "My personal opinion is that games, as any other medium, can tackle any topic. The real question is how they do it," writer Pierre Corbinais says. "We tried to make something respectful, and one of the crucial aspects of that was to involve someone who actually lived through the whole experience—in our case, it was Dana." Bury Me, My Love wouldn't exist without the help of Dana, a young Syrian woman who served as an editorial consultant. It isn't a play-by-play of her experience—and obviously it couldn't be, since the game can go in 19 different directions—but her life heavily influenced it nonetheless, in addition to the stories of other refugees. "What also struck us while seeing [screencaps of] Dana’s conversations was that there wasn’t much pathos in there," game designer Florent Maurin tells me. "And when you think about it, it’s quite natural: even when you’re struggling, going through difficult or scary moments, you don’t want to worry your family. You still tell jokes, use silly emojis; you’re still yourself." Released last year, Butterfly Soup was a charming surprise. When Bury Me, My Love was first pitched to a friend of Corbinais', it helped steer some course correction away from an unintended path. "When we started working on this project, I tried to explain its concept to a non-gamer friend, and she told me, 'Oh, so it’s like a Tamagotchi, but with a Syrian refugee?' I was petrified. No. No of course it wasn’t, but that’s when I realized we had to be extra careful," Corbinais says. "We wanted the player’s choices to impact the story—after all, we were making a video game—but we still wanted the player to feel quite powerless. That’s why in Bury Me My Love you don’t 'control' Nour, nor [the player character] Majd who has his own personality, and when you do suggest something to Nour, she might not even listen to you. However, every choice you make does have an impact, it affects variables like Nour’s morale or trust in you, and those variables affect Nour’s decisions." Over the course of talking to people for this series, usually the last question I would ask was what their favorite part of their work was. Sometimes they highlighted specific moments, like a particular character arc or scene. Other times it was something broader, like working with co-workers to solve a problem, or some juicy bit of research that struck them with inspiration, or even just meeting a childhood hero. No two answers were ever vaguely similar. Players, too, can say the same thing. Storytelling, no matter what avenue or form it comes in, hits us all in different ways. In just the past few years, we've seen YouTube videos of movie-length breakdowns about lore based on weapon descriptions in games. We've seen word of mouth carry indie visual novels and other unexpected niche titles to wider audiences; some landing awards, others on prestigious game of the year lists. We've upheld the developers exploring their nation's dark histories through the unlikely medium of video games. And writing, now more than ever, has shown to be one of the most inspiring aspects of a game. What players may consider to be the "best" writing in games isn't just reserved for grim triple-A revivals and RPGs anymore. It takes me back to Tomb Raider writer Rhianna Pratchett telling me about that rinky dink U.K. gathering that's blossomed from a few writers to dozens. Our industry has grown, and it's evident in the stories we play and the people behind it. In the face of growing job instability, labor issues, and writers being tasked with "fixing" something in a late-hired narrative paramedic capacity, it's up to us—the players, the critics, the industry—to read between the lines for a change, and consider games as more than just that first name we see on the credits. Header art made by Caty McCarthy, including photo "Typewriter" by Takashi Hososhima, licensed under CC-by-SA-2.0. Tagged with Bury Me, My Love,	Butterfly Soup,	CD Projekt Red,	Feature,	Writing in Games.